With the opening of the new Race Street Pier last month, Philadelphia took an essential step forward in riverfront revitalization. 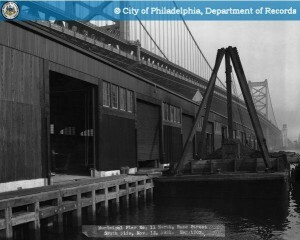 Jutting into the Delaware River just below the towering Benjamin Franklin Bridge, the former Municipal Pier 11 was built in 1896. From late 20th Century on, it sat empty and unused, another segment on a strip populated by big box chain stores and the occasional hotel, segregated from the street grid by Interstate 95. Several visions were put forth in recent decades for an overhaul of Philadelphia’s waterfront , but none ever seemed to bear fruit (thanks to a combination of bureaucracy, grandiosity and a suffering economy). Then, in 2009 – at the urging of Mayor Michael Nutter – the newly formed Delaware River Waterfront Corporation began to implement the Action Plan for the Central Delaware, developed by UPenn think-tank Penn Praxis. 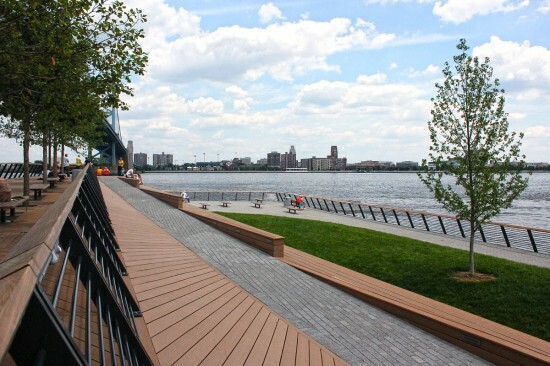 Instead of expensive, overarching renovation, the new agenda called for small, incremental steps, with goals of reconnecting the street grid to the water, adding green space and making it easier for people to experience the riverside on foot and via bicycle. It looks like the piecemeal strategy is working. For example, a paved bike trail now meanders along the southern banks of the river, starting at a small rain garden, which blossoms with greenery behind the Walmart at the intersection of Washington and Columbus Blvd. 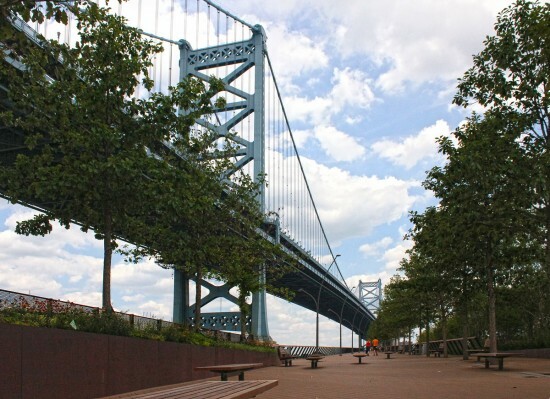 Funding for the pier redevelopment was secured from the William Penn Foundation and others, and New York-based Field Operations won the bid to create a public park atop the 500-foot metal wharf. Led by Philadelphian James Corner, Field Operations is the firm behind the transformation of an old elevated rail line into NYC’s immensely successful High Line Park. 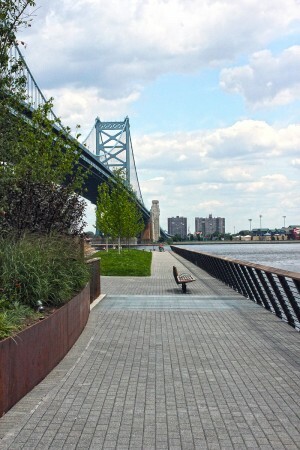 Their track record remains stellar with this Philadelphia endeavor, where they’ve created a winning public space. The bi-level jetty features several dozen white oak trees and a myriad of grasses and flowers along its length, culminating in a tiered seating area at the eastern tip, which doubles as stairs connecting the split upper and lower walkways. At high tide, the water is just 4½ feet below the pier’s edge, providing a feeling of being out in the river achievable nowhere else in Philly. An uncommon view of the majestic Ben Franklin Bridge impresses, both during the day and at night, when it’s complemented by an array of 200 LED solar light blocks embedded into the paving. The pier is understated but attractive, welcoming and accessible, clean and friendly, with unique views and perspectives. Here’s hoping what happened on Race can be repeated throughout the riverfront. Official summer hours are 7 AM–11 PM (and it’s the perfect spot to catch tonight’s Independence Day fireworks).